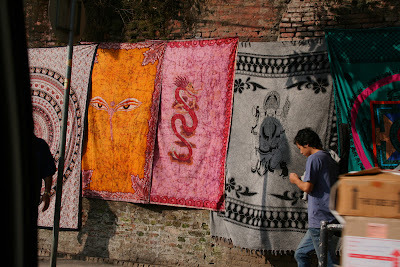 BOHEMIAN adventures: it's not my imagination! A couple of my articles are out now. Cruising the Galapagos with a Carbon-Neutral Conscience, E/The Environmental Magazine, Nov 2007. Unfortunately you need a subscription to access it... but soon enough I'll post a version online. Don't Mess with the Snappers: Irascible conservation veterans keep fighting for their beloved Big Thicket. Texas Parks & Wildlife Magazine. Dec 2007. The link still goes to the Nov issue as of today but the Dec issue will be up soon. 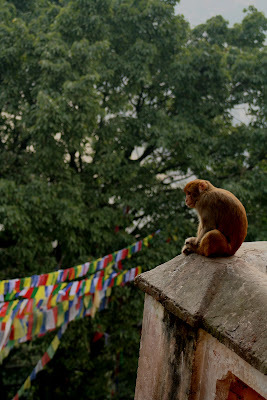 Fabrics, Kathmandu Macaque at the monkey temple, Kathmandu, overlooking some Tibetan prayer flags. 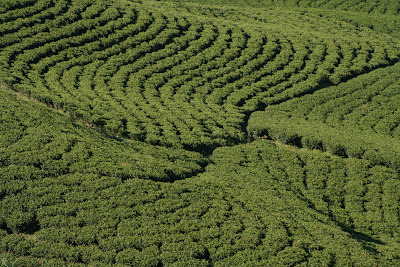 A tea plantation in eastern Nepal. 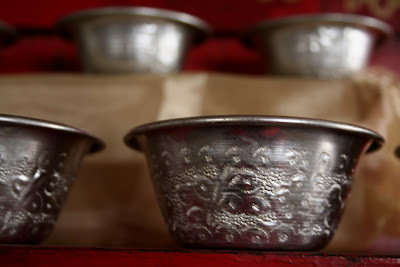 Tibetan bowls in a Buddhist temple in Meghma, India. 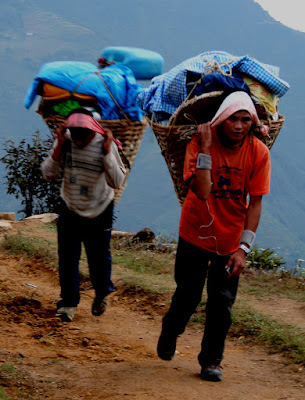 The porters carry stuff in baskets that they balance with their heads. It's amazing how much weight they can carry... they would carry 4 of our backpacks/duffel bags in one load.